The word ma’ (means) Hemp; -----or does it? Unlike the Indo-European language groups, Chinese languages have the general rule that each word consists solely of one syllable or individual sound. Meaning that words like, She, He, Eye, It, etc., can be translated directly into their Chinese counterparts, while a multi syllable word like, ‘antidisestablishmentarians’ (and actual English word), would sound extremely strange to the ears of a native chinese speaker. 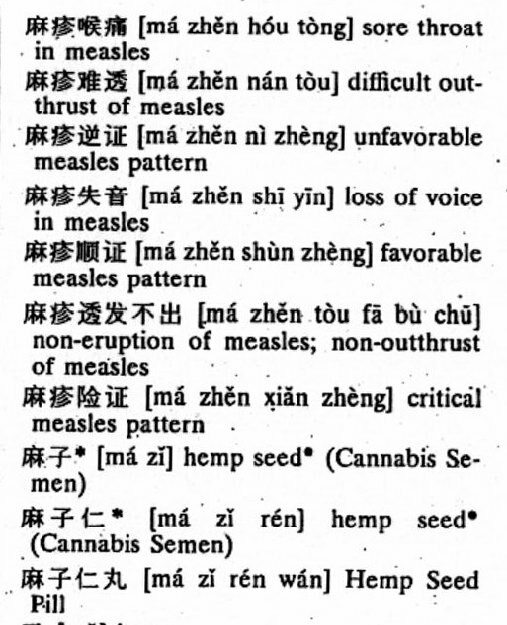 However, be that as it may, Chinese do have some very odd-ball concepts that the student of Medical Cannabis needs to be aware of. 1- First many Chinese words consist NOT of words of and-by-themselves but of compound-words. Words that when put together (in a certain order) have their own different meaning. All of which are suppose to translate simply as ‘hemp seeds’. “Chinese is a very tonal language. Mandarin Chinese consists of 4 tones (flat, falling, rising and rising/falling). Tone is extremely important to the understanding of spoken Chinese. For example “ma,” the Chinese word for “mother” has a flat tone. While “mâ,” or “horse” has a rising/falling tone. Using a rising tone when saying “ma” will change the meaning to “hemp.” Depending on how the tone is applied to “ma,” the meaning can vary drastically. It’s easy to then conclude that “ma” has potentially 4 meanings based on tone, but it is far more complicated than that. 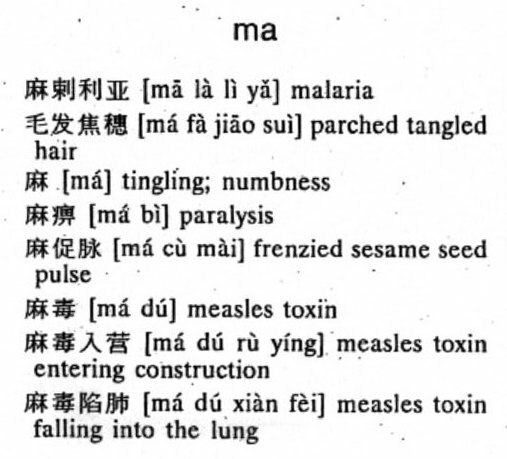 Depending on context (specifically the words surrounding “ma”) the meaning can change drastically. --- Chinese does not have a grammatical distinction between singular and plural nor does it have verbs that indicate tense. These are indicated by syntax. Tense is implied by the addition of adverbs of time (yesterday, tomorrow) and singular/plural is sometimes implied by the addition of numbers (and modifiers to pronouns), but in most cases words are not modified. Questions share the same grammar as do other sentences, but have the addition of the particle “ma” on the end, making it a question. Making it safe to conclude: with Chinese, Context is Everything.” -- Copyright © 2007 Advanced Language Translation, Inc.
4- Last of all, and as a final insult. There are two ways of translating Chinese sounds into written English -- [A] Pin-Yin (used in Mainland China) and [B] Wade-Giles (used by Nationalist China). 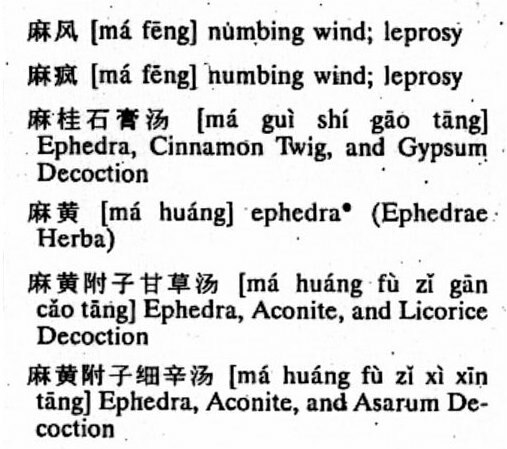 Now to put everything else together, the following is taken from a Chinese to English Dictionary  and consists SOLELY of those words which begin with the sound pattern Ma’. Note that they can all be sub-divided into three different groups. [a] those dealing with agriculture [b] those dealing with medical subjects [c] and those (such as the drug Ephedra) which have nothing to do with hemp, but need it’s concepts to form its own word.